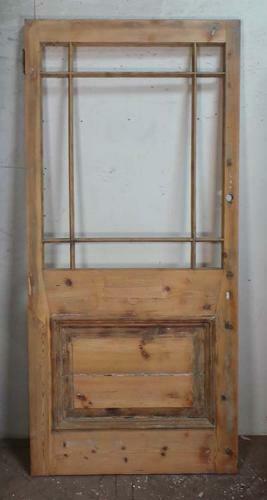 This lovely original Victorian pine door is fully morticed and tenoned, and features a geometric glazing panel in the 'Cardiff' style above one solid panel, which is raised and fielded to the front face. The door is suitable for internal use. The door is in good, used condition. The door has been stripped, ready for painting, and has patch repairs to the lock/letterbox area, and also a patch to one side rail. There is a split to the solid lower panel, but this is easily filled. The door is currently unglazed. Any new glass fitted will have to meet current safety regulations, and we are happy to quote for this, so please call with your requirements.